You can read the book in various format by clicking on this link or view it here. Below is the text format to help with keyword searching when you are doing genealogical research. This short genealogical history of the Fisher family was under- taken primarily for my children. It has been the intention to bring together genealogical material not already assembled, although much valuable work has been done previously in separate lines. However, diligent research was required, and numerous historical accounts of immigration, settlements of frontiers, and county histories have been carefully read, many court records deciphered, and hundreds of letters written. Most sincere thanks are expressed to those members of other branches of the family who have lent aid so generously. Numbers placed before names of individuals are for convenience and do not indicate the number of descendants, many of whom have not been included. A page number placed in parentheses at the left margin before a name indicates where the short biographical sketch of that individual may be found. land with only what means he could carry with him. and it was almost as bad after they arrived in America a year later. Germany, to look into a supposed fortune due the American branch. disgusted when this became known to them. about seventeen miles northwest of the present city of Reading, Pa.
Fisher ever received title to any land in Pennsylvania. Dr. Charles A.
found no record of title. bore one child after the removal to Tulpehocken, Pa.
3. George Ulrich Fisher, b. ca. 1712; d. 1770; m.
(11)7. John Adam Fisher, b. ca. 1724; d. March, 1783.
child of Sebastian and Susanna Fisher when they arrived in America. scended from the same immigrant ancestor. the Robinson and Rapidan Rivers, in what is now Madison Co., Va.
witnessed the will of Lorenz (written Larence) Garr. tioned as a foot soldier in the Culpeper Militia in March, 1756.
during her life ; after her decease I give it to my son, Barnet Fisher. five pounds, which is the difference of their lands. but nothing further is known of these Virginia descendants. (16) 14. Barnett Fisher, b. 1752; d. Jan. 29, 1824; m. Eve Wilhoit. 18. Barbara Fisher, b. ; d. ; m. Adam Redenbach. Peter Fisher (Sebastian) was born in the vicinity of Berne, X. Y..
Oct. 4, 1714. according to records in the Schoharie Lutheran Church. in Albany or Schoharie, N. Y. She may have been his second wife. John Jacob Fisher (Sebastian) was born in the Schoharie Valley. was an elder in this church for many years. 26. Christian Fisher, b. 1751 ; d. ; m. Maria Breitenbaugh. fourth child, John, is also recorded at Christ Church. they were the parents of four little children. part of Hardy County. Still later when West Virginia was created. tinct families in Virginia. Kentucky and later in Missouri. ley, and some feared that the entire country would be laid waste. tion of the settlers, but this did not come to pass as he predicted. death in an Indian raid, but it was a subject which her brother. Dr.
of Adam’s sons served in the Army. the education of their children was never neglected. (19)34. (John) Jacob Fisher, b. (chr.) Oct. 29, 1758; d. 1839; m.
(22)36. George Fisher, b. March 1. 1765; d. 1820. (23)37. Michael Fisher, b. Sept. 15, 1767; d. Jan. 15, 1824; m.
(24)39. Solomon Fisher, b. Feb. 6. 1773; d. May 28, 1841; m.
Ky. where he died about May 20. 1817. Fisher’s family will not be included here, after this generation. 48. Rosannah Fisher, b. Nov. 25. 1781; d. Nov. 24. 1876; m.
50. Ann Fisher, b. ; d. 1871 ; m. Strother Gaines ; five children. Adam Fisher (Lewis. Sebastian) was born in Virginia in 1740.
ing his home in Mercer County. asking for a right to establish a new state. He died July 5, 1812. 52. Margaret Fisher, b. July 25. 1760; d. Sept. 3. 1824; m.
71. Sampson Wilhoit, m Jackman. Missouri, and probably to the vicinity of Boonville. given name is so. uncertain that it seems best to omit it altogether. 72. Elizabeth Souther, b. Dec. 2, 1774; d. Oct. 24, 1854; m.
73. Abraham Souther, b. Aug. 8, 1776; d. Sept. 10, 1843; m.
with the present compiler’s family. 27 of the order book of Culpeper County. grants and patents between 1780 and 1783 amounted to 3,253 acres. Mercer County, Ky. tax list in 1789. 1823, are buried in the family burying ground. (31)82. Fzekial Fisher, b. ; d. May 15, 1848; m. Ann Watts. the work that Dr. Charles Fisher of Selinsgrove, Pa. has done. Pennsylvania at the time of the Fishers’ migration. Speece’s Company of Rangers from Northumberland County, Pa.
(31)90. John Jacob Fisher, b. Jan. 15. 1786; d. July 23. 1846; m.
90. John Jacob Fisher, b. Jan. 15, 1786; d. July 23. 1846; m.
91. John Michael Fisher, b. Aug. 29, 1789; d. July 23. 1820; m.
92. David Fisher, b. 1791 ; d. 1827 ; m. Polly Yocum. his six sons in order of age and Adam, Jr. is named first. Adam Fisher. Jr. was married to Jemima Mace, who survived him. Missouri branch use the “s”. 1795 and Nov. 8. 1796 to Dec. 27, 1796. Henning’s Statutes. Vol. XVI. p. 51 states that on Jan. 16. 1804.
son (93) William Fisher, in 1829. (32)93. William Fisher, b. Feb. 14, 1786; d. March 11, 1858; m.
went to Franklin County, Mo. buried Hardy County, W. Va.
from November, 1798, through the session ending February 6, 1806. He was a physician of considerable ability. Valley. Pa., the son of Sebastian and Susanna Fisher. the year 1758 and the 24th of October. and still resides and ever since resided in that County. another term of three months. Moses Hutton, Lieutenants Heath and West, Hardy. service of months as volunteer these were regular officers with him. tour ended in July. 1781. making it three months. near the Brakes in said County of Hampshire (now Hardy). the agency of any state. day. The original home was burned and has been replaced. (35)103. Mary Ann Fisher, b. Oct. 20. 1786; d. Sept. 4, 1864; m.
(37)106. Elizabeth Fisher, b. Feb. 9. 1792; d. Sept. 23, 1861; m.
cation as proof of their father’s descent from Sebastian Fisher. 10. 1832. while a resident of Picqua County, Ohio. living in 1840, according,” to the U. S. Census of Pickaway County. 107. Elizabeth Fisher, b. ; d. ; m. Reubin Dice; son. 110. Louisa Fisher, b. ; d. ; m. John Fluke; children, John. 115. Jacob Fisher, d. young. list of 1787 gives his name with three in his family, with four slaves. nothing to show it to have been a fact has been found. Illinois about 1798, and became a prominent citizen of Kaskaskia. of 1816-17 and of 1817-18.
received and cared for all that were afflicted with the disease. tion lasted for years. His son Jacoh was Executor of his will. desired to establish a tenanted Manor such as was common in England. settlers were given title to their lands. Ann Petty, who had previously migrated from Hampshire County, Va.
the removal of the mill. Michael Fisher was an early Justice of the Peace in Hamilton Twp. He died January 15, 1824, and Sarah, his wife, died January 2, 1843. 122. Joseph Fisher, m. Sarah Landis. Solomon Fisher (Adam, Sebastian) founder of the Frankford, Mo. Regiment. 2nd Battalion. Bourbon County Militia, by Gov. Garrard. with his family in Virginia. at the time of his removal to Missouri, Sept. 13, 1817.
purchased on Sept. 16, 1807. from his father-in-law. Joseph Pettv. came up in later years regarding boundaries of land thus described. and a public square to be used for the erection of public buildings. He also gave land for a church and a park. is most picturesque, and is a thriving agricultural town. Betsey Hostetter. who survived until after 1850. His death occurred on May 28, 1841, after a protracted illness. (40)129. John King Fisher, b. Sept. 11. 1810; d. before 1850; m.
(42)132. Emmarilla Fisher, b. Dec. 31, 1819; m. E. C. Turnbull. son County. Va.. about 1770. His death occurred in 1834.
his will was proved on January 15, 1834. Census records show that these people had four other children. slaves, as Executor of his father’s will in Mercer County. ways believed Joseph and Solomon to have been brothers. the U. S. Census in the household of their son (138) William W.
(42)138. William W. Fisher, b. May 28. 1808; d. Jan. 9, 1882; m.
144. Nancy Fisher. The order of age is uncertain. available, except the list of their seven children. Caleb Fisher (Barnett, Lewis, Sebastian) was born June 3, 1776.
but an older woman was listed in his family. Sarah Fisher (Barnett, Lewis. Sebastian) was born on April 21.
line, so generously shared by Mr. Charles B. Heinemann. obtained from court records, U. S. Census records, and other sources. Fisher Watts. He remained in Mercer County. Ky.
169. Clayton Fisher, m. Elizabeth Garrett. and died on August 16, 1862. 175. Elizabeth Fisher, b. March 24. 1840; d. Mav 30, 1882; m.
Samuel Woodling. Feb. 2. 1860.
daughter of Dr. Jacob and Susannah Burns Fisher. In his father’s will in 1816, William Fisher was named Executor. but also the best pasturage. riding animal which she allowed no one to ride, not even her husband. William Fisher died March 11, 1858. His wife died Sept. 23, 1861. (43)177. Susanna Martha Fisher, b. Sept. 18, 1823; d. 1867; m.
(43)178. Jemima Fisher, b. July 13, 1828; d. Nov. 19, 1903; m.
181. Adam Fisher, b. Jan. 26, 1834 ; d. May 29, 1837.
man. Several of his sisters likewise went to Franklin County. lin County in 1850, but it is believed that all removed to Oregon later. old iron-bound bucket, still remains. resented Pendleton County in the Assembly for several terms. eldest son. Jacob Johnson. Her death came Sept. 4, 1864. 1886; m. A. J. Rankin. 2, 1809. Mary Ann Harness was born May 5, 1790 and died Dec.
(46)208. Jesse Fisher, b. 1834; d. V)\7 ; m. 1. Jane K. Welton. 2.
cousin (93) William Fisher, son of Adam and Jemima Mace Fisher. parents to Bourbon County, Ky. when he was about one year of age. and his wife in the spring of 1818 migrated to Missouri. Settle, at the time of her marriage. was Constable. Adam was first sheriff of Pike County. of Main Street on the south side of the street. 1825, to “Seney” Fisher and Tyre A. Haden, her brother-in-law. curb were in. A bond issue of $1000.00 had been voted to pay for it. and desks. Pens, of course, were made of goose quills. (50)213. Joseph Fisher, b. 1824; m. Eliza Bryant. Potomac in Virginia where both had lived as children. family settled in Missouri, Eunice Fisher was married to Tyre A.
Haden. This was the first marriage performed at Frankford, Mo. peated efforts the compiler has not been able to find any record of them. near to (78) Joseph Fisher of the Lewis Fisher line. and their ability to feed off the country better than horses. George Fisher died in California on October 4, 1849. Cave and Spring, near Frankford, Mo. Lower, Lt. Col. William Loren Fisher at Tientsin, China. (50)214. John Porter Fisher, b. July 13. 1822; d. Nov. 25, 1903; m.
marilla, born after they settled in Missouri. ford names of only six children have been found. She died in 1892. 222. Maxamilla Mase, b., after 1850.
family remained in Frankford and descendants now reside there. 231. Eliza Fisher, b. 1855.
accompanied her parents to Missouri at the age of about eleven years. of Tyre Haden, husband of Parthenia’s older sister, Eunice. 232. Edward Haden, m. Harriet Hostetter ; children, Cora, Homer. 235. Woodson Haden, m. Louisa Holman. father’s estate in 1841, but died before 1850.
that part of Virginia from which Solomon Fisher originally came. fith, wife of (247) George W. Fisher. 240. Elvira, or Elbira Haden. this branch particularly for most of the genealogical data given here. been tireless in answering repeated requests for more. and Beatrice. Reside in Ogden, Utah. children of Solomon and Mary Ann Fisher, was born in Missouri. Kentucky. He was on the Kentucky Tax Lists of 1827. Ralls County, Mo. with his parents in 1829 from Mercer County, Ky.
1851. He moved to Pike County. Mo. in 1848. In 1853 William W.
History, published in 1883. William W. Fisher died January 9, 1882. 262. Joseph A. Fisher ; went to Texas in 1889. Republican and a Lutheran. In his youth he served in the local militia. he was often consulted on various subjects by his neighbors. who was born October 15, 1828, and died December 24, 1910. Mr.
Fisher died October 13, 1901. (54)263. Jacob Adam Fisher, b. Oct. 7, 1863; d. June3, 1940; m.
was married in 1850 to Michael Lancaster. She died in 1867. 264. Elizabeth Ann Newby, b. Aug. 21, 1845; m. Capt. E. D.
265. William Oswald Newby, b. March 4, 1848; d. in infancy. 269. Susanna Lancaster, b. July 31, 1859; m. Robert Stewart. Koiner, who was born on May 10, 1820, and died on June 8, 1889.
a flour mill near Franklin, W. Va. This old mill is still standing. husband’s parents across the Alleghenies at Spring Hill. After the war Andrew Jackson Rankin took his family to Mexico. 28, 1886. Mr. Rankin married a second time. He died June 25, 1901. (57)283. Lucie Ann Rankin, b. Jan. 29, 1855; d. Dec. 15, 1927; m.
286. Susan Clara Rankin, b. June 11, 1861 ; d. July 7, 1933; m.
287. Walter Temple Rankin, b. Sept. 14, 1864; d. ; m. 1. 289. Johnnie James Rankin, b. June 3, 1870; d. Oct., 1873.
land on the South Branch of the Potomac River. 296. Otto Shultz Fisher, b. 1868; living; m. Lillie Baker. her death he was married to Betty Paxton. 298. George Welton Fisher, b. 1872; d. 1928; m. Myrtle D.
(59)299. Eunice Virginia Fisher, b. 1874; living; m. Rev. A. M.
lives. Mary Ann Sitton died prior to 1885.
small children, of whom William P. was the second. land surrounding his property was also surveyed by Mr. Fisher. bush to their door-yard where it grew and bloomed for many years. Fagg’s Regiment of Missouri Militia. Lieut. Colonel of the Seventy-third Regiment, Missouri Militia. However, the regiment was never mustered in. reared his younger children with great affection and strict discipline. (60)306. Joseph Warren Fisher, b. June 2. 1844; d. Feb. 7. 1907: m.
309. Mary Ann Fisher, b. Dec. 31, 1849; d. May 14. 1917; m. 1. (62)310. Martha Fisher, b. Dec. 31, 1851; d. Feb. 11, 1926; m.
312. Emily Fisher, b. Dec. 27, 1856; d. Sept. 24, 1923. unmarried. Names of other children not known. 317. Mary Ann Fisher, b. 1849; d. ; m.
There may have been other children. January 13. 1822 in RaUs Co.. Mo., and died on November 25. 1903.
he was married on October 5. 1848. In 1853 they moved to’ Louisiana. Mo. where Emmeline Fisher died in April. 1861. 28. 1841 and died March 5, 1923. 319. Cicero Early Fisher, b. March 16, 1851 ; d. Feb. 16, 1852. 321. Adeline Fisher, b. March 26, 1854; d. June 23, 1921; m.
324. Adam L. Fisher, b. April 28, 1861; d. Feb. 14, 1873; res. 332. Porter H. Fisher, b. Feb. 11. 1876; d. April 16, 1912; res. 334. Russell H. Fisher, b. July 19, 1880; d. July 30, 1932; m.
three times ; res. Wilmington, N. C.
Vicksburg. He died from the effects of his wounds on May 27, 1863.
to Montgomery County. Mo. soon after and on Sept. 20, 1851 Mr.
Christian Church. He died in Frankford in 1907. 339. Eurania Bell Fisher, b. ; d. Dec. 26, 1931 ; m. W. E.
for a sketch. Eunice Fisher was a resident of Frankford, Mo. Samuel Archambeau. Third, she was married to Thomas Beaver. callers were delighted with her accounts of some of her experiences. 1935, at the age of eighty-three years. U. S. Census of 1850 as an infant of less than one year. Mo. where he remained for the rest of his life. He died in 1920.
where he spent his winters during the last twenty years of his life. had knowledge far beyond his formal schooling. was born in Chapman township, Snyder Co., Pa. on Sept. 17, 1865. 356. Eva May Fisher, b. Nov. 7, 1893; d. March 11, 1937; m.
360. James Byrl Fisher, b. April 17, 1885 ; living. Octy5, 1932. He was a most esteemed Christian gentleman. Paris; debut. Metropolitan Opera Company, N. Y., 1935. 1920. Mrs. Lloyd is living. 373. John Luther Lloyd, b. Sept. 9, 1908; d. 1926. Mrs. Fisher was born October 10, 1869. 377. Rush Fisher, b. Oct. 28. 1907 ; living. over four Counties and there is but the one court in these counties. was the Democratic nominee for Governor of West Virginia. 382. BaSgfiyisher, b. March 17, 1909; living. 17, 1897. Mrs. Fisher was born December 31, 1875. 385. Frances Gertrude Fisher, b. July 14, 1910; living. 394. Robert Jake Morrison, b. Oct. 25, 1924. Texas, and went immediately to reside in Kentucky. Red Boiling Springs, he joined the mercantile business of Capt. December 15. 1927, survived bv her husband. 397. Marvin Kavanaugh Cloyd, b. July 3, 1882; living; m. 1.
inson ; res. Tenn.. son, Clovd Andrew Robinson. was married to May Eberly. He died in 1939. 409. 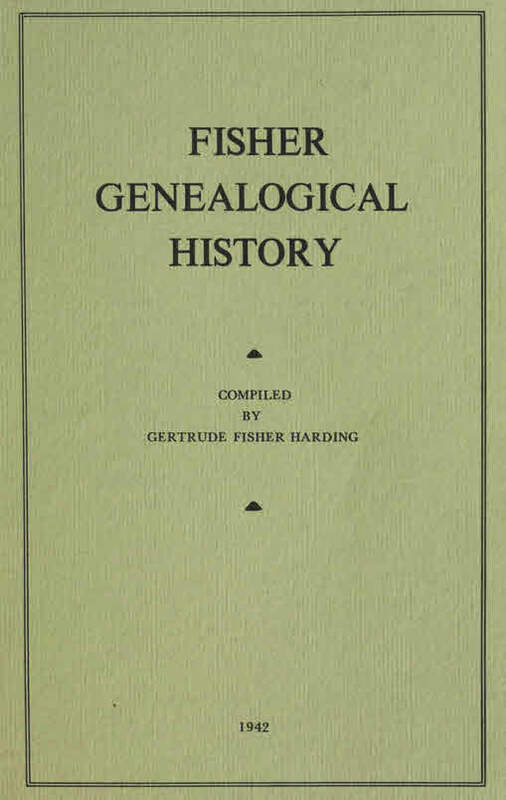 Clarence C. Fisher, h. 1913.
material on the family of her husband, and on her own family. compiler wishes to express her appreciation. dead for a number of years. 417. Eunice Virginia Earle, b. 1914; living; unmarried. 423. Virginia Lee Fisher, b. 1917.
gomery County, Mo. and remained there. was discharged December 6, 1864. He was pensioned June 27, 1890. On February 18, 1869 Joseph Fisher was married to Pollie Kizer. man. He was very fond of reading good literature. in the matter of education. and also read law with a practitioner. taught Latin, Greek, trigonometry, astronomy, and other subjects. or medicine. He was successful in several instances. 1892 Mrs. Fisher went to New Mexico, and they were remarried. entered the Soldiers’ Home at Sawtelle. near Los Angeles, Calif.
Home on August 15, 1925.
of its existence, and took a lively interest in politics in the Territory. He was at one time the owner of a large amount of real estate there. children when an elderly widow. of Henrv and Sinia Wycoff Bohrer of Williamsburg, Ohio. Mr.
Martha Fisher Bohrer died at Bellvue. Idaho, February 11, 1926.
fred Kmil. b. July 22. 1916; James Asher. b. Feb. 14, 1919.
her father did. Her entire life was spent in Montgomery County, Mo. Bowlby ; adopted son. Donald Sailor Bowlby. of about six years she had the great misfortune of losing her mother. broken her hip. Her death occurred September 14, 1940. Association, of which she is a Supervisor. ary 14, 1934, Frankford lost one of her most valuable citizens. 438. Howard Weatherford Fields, b. Sept. 25, 1903; living; m.
Mary Una La Motte ; res. Frankford. twelve years old, when she went with her parents to Nevada, Mo. most comfortable farmhouse and are genial hosts. Mefford Cash; res. St. Louis, Mo. the honorary degree of Doctor of Business Administration on him. and Littletown, Pa., and principal of the high school at Lewiston. County Probate and Orphans Court Records. daughter of Simon and Margaret Sassaman Hummel. 447. James F. Fisher, b. July 5, 1928 ; high school student. school she had been in attendance at ten entirely different schools. changes, has been a source of much pleasure. credited public schools for five years before her marriage to Dr.
Calif., while Dr. Harding took post-graduate work. Since August. of Orthopedic Service and later chief of Surgical Service. allied families of her own and her husband’s ancestry. b. March 5, 1942; residence, Berkeley, Calif.
dence, Monterey Heights, San Diego, Calif.